The plaque on the stone monument in the photo memorializes the former site of Fort Ellis that was located a few miles east of Bozeman, Montana. In March 1876, Col. Gibbon's departed from this location with 444 soldiers to the Powder River Country to attack the Sioux. His regiment headed east over the distant mountains (shown in this photo top right) to the Yellowstone River where he was to combine with two other military forces. As described in the book, the convergence plan did not materialize and as a result, Gibbon's campaign experience would be immeasurably different and less deadly than that of the other two. 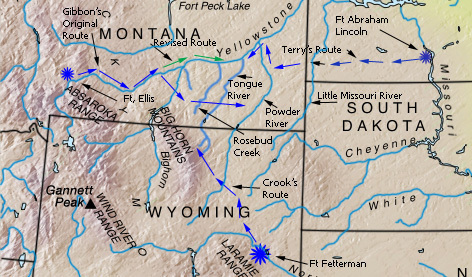 In the map at bottom right, Gibbon's campaign began at Fort Ellis (star at top left in map) and headed east to Rosebud Creek in the Yellowstone Valley. The background photo on this page is of the former site of Fort Ellis that was decommissioned shortly after the Sioux War. Nothing remains except one large building used by the Agricultural Department of Montana.